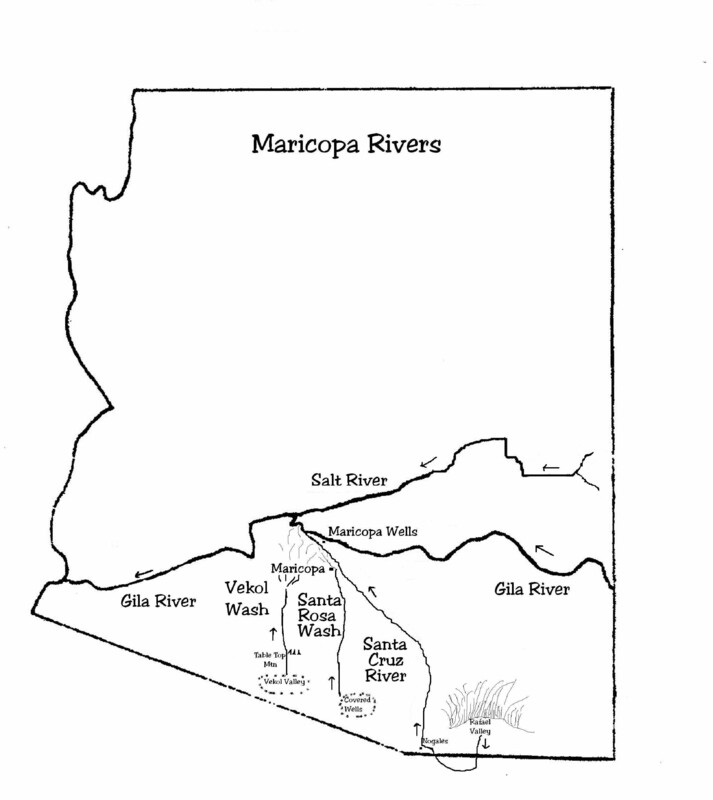 Do you know the rivers of Maricopa? The Gila River is one of the largest desert rivers in the world. It is 630 miles in length and rises in western New Mexico flowing westward into Arizona through the town of Safford and along the southern edge of the Gila Mountains. Then it crosses the Gila Indian Reservation just north of Maricopa Wells and makes a great curve around the northern end of the Estrella Mountains at which point the Salt River joins it. Next, it dips sharply southward and turns west near Gila Bend paralleling the railroad tracks where it eventually empties into the Colorado River. 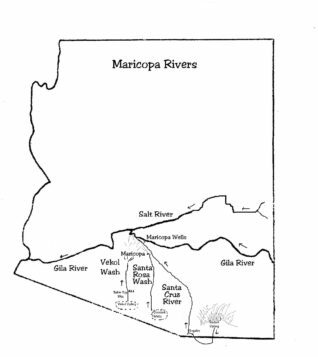 Most southern Arizona Rivers including the Santa Cruz, Santa Rosa and Vekol Wash empties into the Gila River near Maricopa Wells. In the 1860s, Henry Morgan used his ferryboat to carry people, wagons and goods across the waters of the Gila River at Maricopa Wells. A tributary of the Gila, the Santa Cruz River begins near the Sonora and Arizona boundary. The headwaters of the Santa Cruz are in the high grasslands of the Rafael Valley just east of Patagonia. It flows southward into Mexico, turns westward and re-enters the United States east of Nogales. The Santa Cruz River crosses the Maricopa-Casa Grande Highway about five miles east of Maricopa. 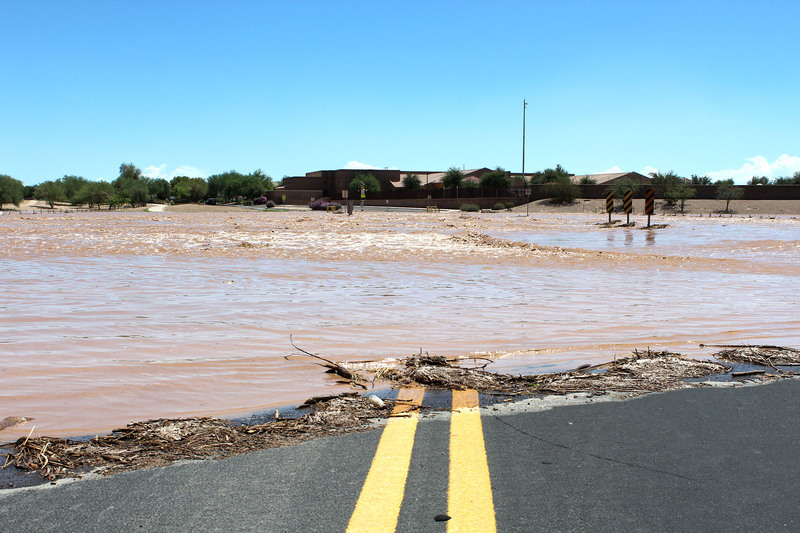 It flows northwest to cross the Maricopa Road approximately five miles north of Maricopa at the second bridge near the Casa Blanca Road. It continues running northwest to join the Gila in the Maricopa Wells area. The Santa Cruz is a dry riverbed unless there is significant rainfall. It can then become a raging force known as a “flash flood.” Surprisingly, as quickly as the angry waters appear, they seem to disappear into a dry riverbed almost over night. Another tributary of the Gila is the Santa Rosa Wash that begins on the Papago Reservation near Covered Wells. It travels north crossing the Stanfield-Casa Grande Highway (84) east of Stanfield. It flows under the first bridge east of Maricopa on the Maricopa-Casa Grande Highway and continues through Rancho El Dorado, crossing the Maricopa Phoenix Highway (347) at the first bridge north of town. The Santa Rosa Wash joins the Santa Cruz River northwest of Maricopa near Maricopa Wells. The Vekol Wash is not a river, but collects water from the Vekol Valley just south of Table Top Mountain. It runs in a single large channel for 25 miles until it crosses the Ak-Chin Indian Community, where it eventually splinters and becomes several channels by the time it reaches the [Union] Pacific Railroad tracks. Its many fingers fill with water during heavy rains that eventually empties into the Gila or Santa Cruz Rivers.